Questions at this seminar are being taken on index cards. I’m just waiting for a moderator to say: “… and our next question is – a very nice little drawing of a cat” (holds up card, delegates go awww). Are You A Happy Carrot? Zoë just drew this. No-one is quite sure why. 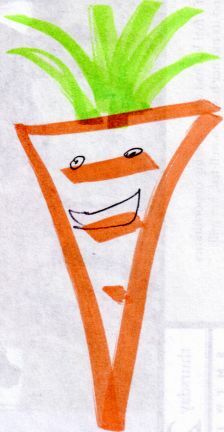 Author scrussPosted on 02005-02-01 Categories goatee-stroking musing, or somethingTags carrot, drawing, whyLeave a comment on Are You A Happy Carrot?